The 11Mbps IEEE 802.11b Wireless LAN CF Card is a standard CF typeⅡ interface adapter integrated with wireless LAN technology. It provides you the easiest and fastest way to access your wireless and wired network. 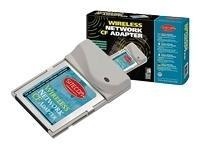 The Wireless LAN CF Card, which utilizes the latest advancement of PC industry – Compact Flash technology, allows you to install and use the card easier than ever before. 11Mbps data rate gives equivalent Ethernet speed to access corporate network or the Internet in a wireless environment. When installed, 11Mbps Wireless LAN CF Card is able to communicate with any 802.11 and 802.11b compliant products.